We talk about boho colors and bohemian interior. 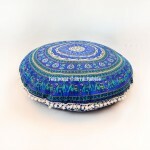 At Royal Furnish, you find vibrant & colorful handmade patchwork Indian pouf ottomans. Each pouf is unique in itself, they are made by different colorful patches of recycled cotton fabric. It is old handmade embroidery work art, where women of rural areas carved embroidery work on old fabrics. Gradually, this handwork gets popularity over period of time in developed nations like USA, UK, Canada, Australia and European countries. To makeover living room area, you just need to add them besides of center table. Moreover, you can add them into your bedroom for extra sitting. 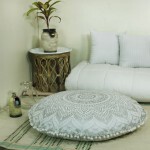 They are comfy, attractive and appealing art adds a boho touch to your seating set-up.